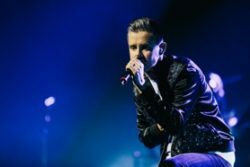 TOM Chaplin, legendary frontman of Keane, begins his tour performing the songs of Queen at Bourne­mouth International Centre on Thursday 18th April, the first of six dates accompanied by the 24-piece Leo Green Orchestra that was behind his London Palladium Queen shows. Tom will perform an array of hits including Somebody To Love, Don’t Stop Me Now, Killer Queen and Bohemian Rhapsody as he celebrates the life and music of one of the most enduring bands of all time. Tickets are still available. For more details, contact BIC.